Thomas Park of Mystified returns to Earth Mantra, this time with a short-but-sweet collection of beautiful abstract drones called EarthWaves. We have long been fans of Thomas's work, constantly amazed by both the amount of material that he produces, the consistent quality of that material, as well as the unending stream of new ideas that come out of his studio. With EarthWaves, Thomas does not disappoint, delivering a new and very clever approach to composition that, as usual, yields excellent ambient music for the rest of us to enjoy. Being the creative soul that he is, Thomas recorded brief excerpts of the INSPIRE broadcast and digitally transformed them into the music that you hear in this release. Very literally, we are hearing the music of Earth's atmosphere, hence the very appropriate title. The result is a lush and slightly mysterious set of drifting bell-like drones, that ebb and flow and interact in ways that seem almost intentional and designed. 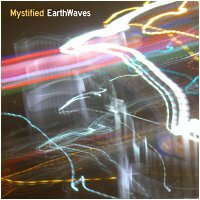 Unlike some attempts at converting natural phenomena into sound, the music of EarthWaves is both intellectually and aesthetically satisfying, suitable for active listening, background mood, or any number of uses. We are blown away by how musical these sferics can be, which of course is simply a testament to the skill and creativity of the artist who molded them. Indeed, we find EarthWaves to be a soothing, almost magical voyage, sort of a combination of a high altitude balloon trip combined with a futuristic radio astronomy rig. Brilliant. So it is with great pleasure that we welcome back Thomas Park to Earth Mantra, and unveil his latest release EarthWaves, another example of his mastery of all aspects of the art of sound. Highly recommend to all of our listeners. Special Note: be sure to check out the companion movie, in Microsoft WMV format, which has an excerpt of the music of EarthWaves along with some cool video. Sonic alchemy. Once more Thomas Park manages to reveal the hidden beauty of some natural/random sounds. These new short pieces are very experimental and mysterious, but in the same time easy to listen (at least to my eras) and drift on. Rather than just electronic composition, this is some kind of sonic alchemy.